This post introcudes FAT recovery software and tells how to perform partition recovery and file recovery on FAT drives with free data recovery software. Till now, there are a bunch of file systems adopted by different operating system, such as FAT32, NTFS, exFAT, EXT2/EXT3, HFS and many other file system formats. New file system becomes popular doesn’t mean outdate of old file system. FAT is one of such file system format. FAT is well known to all computer users though it has a lot of limitations on single file size. It is quite simple measured by today’s standards, for instance, it doesn’t have any forms of management of permission and any built-in transaction roll-back. We have to admit that FAT is still very popular on many storage devices, which should thanks to that it is easy to apply and requires little resources. There is no better alternative of FAT for mobile storage media and devices with small capacity. FAT (File Allocation Table) is mainly used by memory card and USB flash drive. Most memory cards are placed in digital camera, cell phone, media players and other devices to provide storage capacity. Many smartphones running Android or Windows system supports memory card with FAT file system format. In a word, FAT is not out of date. Since FAT file is popular and widely used, it must be necessary to know ways of data recovery that is workable for FAT. This post is going to introduce skills and solutions provided by recovery experts and summarized from recovery software. Let’s have a look at brief explanations of FAT recovery feasibility before we go deeply to file system internals. Actually, operating system including Windows, Android, Windows phone and other systems that used by digital devices doesn’t totally erase or remove all data info when files are deleted or formatted. System makes a record to file system to tag disk space taken by deleted files as free or available. Then users can’t see deleted files but able to store new data to free space. So you’ll understand why it is so quick to remove disk data. So you see, the real content of deleted file stays undisturbed on sectors of storage media. This makes FAT recovery software able to work. However, if these sectors get rewritten or overwritten, then it won’t be available for data recovery. Now, the question becomes “how to recognize and analyze which data staying on these sectors belongs to a particular file.” With the purpose of doing so, FAT file recovery program should be able to scan all sectors and identify all kinds of file characters so that it can finds out and recognize different file formats. For FAT recovery, some recovery tool often restores file by analyzing content characters. Files differs from each other by file format which has its own special way of organizing and forming cdata when it is stored on storage sectors. Recovery software like Eassos Recovery scans sectors of appointed drive or partition and identify file together with its format by analyzing its characters. It has a large lib and advanced algorithm to check and read file header and then knows file length, type and content. The recovery tool integrate data stored on different sectors and makes it available for preview. This solution can be used to deleted recovery as well as format recovery. If you are trying this approach now, you’ll realize that it has a couple of problems, for instance, it restores data with slow speed as it scans sectors one after another. Also the number of file format it supports is limited, like Eassos Recovery supports more than 200 file formats when it restores data by type. You might say that 200 file formats have included almost all file types people use, and yet many users do not want limit. Recovery software assumes that data stored on sectors following file header belongs to same file, which, however, most of times is wrong. As we all know, files are stored on disks in a discontinuous manner, and there are fragments on the disk. Therefore, one file can be divided into several parts on inconsecutive sectors. Recovery of lost data with fragments is difficult task to both recovery program and experts. Sometimes, too many fragment may lead to unrecoverable result or incomplete file. As a matter of face, recovering files by type from FAT disk is workable especially when file system is damaged. And it is the last resort to save lost data. The only regret is the recovered files do not have original name, which doesn’t matter if you are trying to recover photos and pictures. 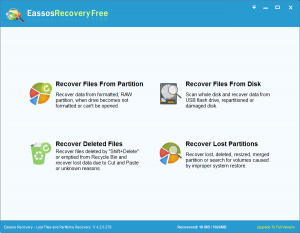 Eassos Recovery has improved algorithm to recover files with fragments and it has specialized scanning method for FAT partition, which will be trigger automatically when it detects the partition being recovered is FAT file system. Information from file system and each sector will be further processed and analyzed to identify files correctly and completely. As has been discussed, data recovery by file type works well when file system is damaged or missing. And FAT recovery program can’t get any info or clue to retrieve lost file. Therefore, we can get better recovery quality if file system is available to provide useful information. Let me give you an example, when we want to recover a large file which is typically for fragments restoring manner. Simply recovering file by using signature without referring to file system will lead to the successful recovery file data and yet file name, creation and modify time, properties, etc. can’t be recovered. That’s because file info is saved in FAT file system. Operating system like Windows access file and know which sectors belong to one file by extracting records from file system. FAT file system tells whether a file is deleted, where and how it is stored, etc. File system is important to partition and partitions are created to store data. File system manages data for partitions, how do partitions work under Windows? Windows operating system manages partitions (FAT partition or NTFS partition) with partition table. One hard drive can be divided into one or more partitions with certain file system. Partition table records partition’s size, type, length, stating address, etc. For instance when we say a hard drive is partitioned into four divisions with different drive letters and volume names, then partition table records information about partition type, initial and ending, size, etc. for each partition. For the sake of gaining information from file system, recovery tool should analyze partition table first if the FAT partition is deleted or missing. However, it is possible that this no partition table available for analyzing such as hard drive has been repartitioned and new partition table won’t have any information about the lost FAT partition. If so, the FAT recovery tool have to scan the hard disk to find out needed file system. Partition recovery software searches for lost partitions with the assumption that each partition has a well file system so that it can be identified by its characters. NTFS and FAT file system are different in many aspects. When recovery tool identify data on beginning sectors of and judge whether it is a FAT partition or not. For example, if values in these sectors are “0x55” and “0xaa”, then this is a FAT partition. Moreover, further checking will be done to verify the initial judgment. Further check goes to detailed values of FAT file system, for instance, number of sectors included in cluster. If there are not qualified value stored, the structure won’t be regarded as file system. When the recovery program find out file system for the FAT partition, then it starts to analyze its records. The reason why we do this is making certain that information and addresses of certain sectors on the drive are owned by the deleted file. Then FAT file recovery software is able to scan file system and get data recovered. File Allocation Table records each file with corresponding address which is usually called directory entry. Directory entry is in charge of recording information of data like name, properties, modify time, directory structure, creation time, etc. Besides, file system records cluster information. Cluster is the smallest unit system access data, which is comprised of several disk sectors. 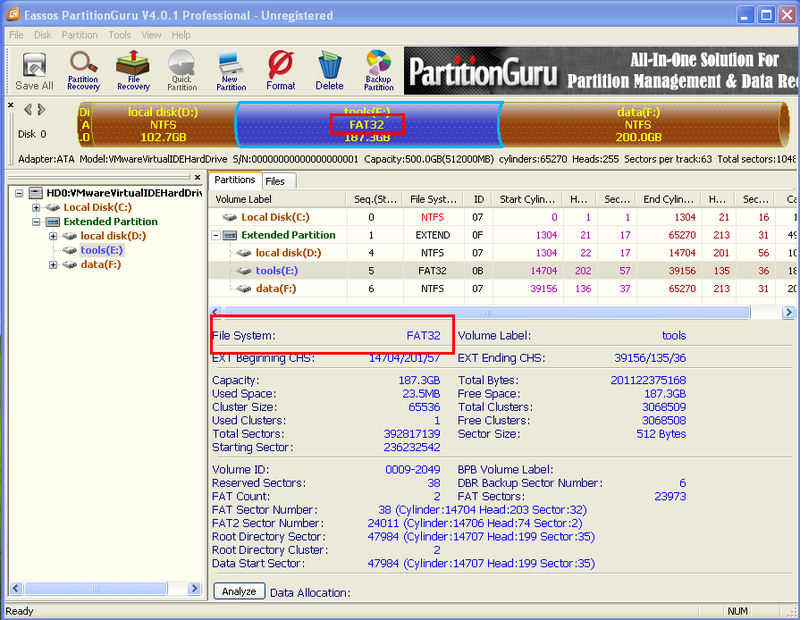 The number of sectors forming a cluster is fixes for each FAT partition. Thus cluster stores data and directory with equal length. The first part is reserved area which covers important data of file system. The area takes one sector in FAT 12 and FAT16, and yet FAT32 is allowed to use more than one sector. The Reserved part is usually located in the boot sector. The second part follows reserved area which contain primary and secondary structures for FAT file system. Its size is decided by the size and number of FAT structures. The last area is responsible for storing actual data. Data content are stored on this area. Thus, we can see data content and directory are stored on separated area. In addition to that, the real situation of each parts of FAT is much more complex and the recovery of FAT is not that easy as we thought. It is vital to identify these three areas correctly. The reserved area together with boot sector are called reserved area. It always begins from sector number 0. The FAT part includes one or more FAT structures. Based on analysis, we are closer to FAT file recovery. Suppose a file just has been deleted by accident and no writing action to the drive. So clusters which store the deleted file and are marked as free haven’t been overwritten. Let’s start recovering it. We should know that operating system that has highest priority has ability to remove corresponding FAT records. Therefore, we can only get information about file’s initial address, size and attributes instead of subsequent clusters. It seems that we can’t retrieve entire list of clusters that form the deleted file. However, FAT file recovery software can try to restore file content by analyzing the first cluster. If the deleted file is small and stores in one cluster, then great! The deleted file will be recovered. If the deleted file id larger than a single cluster, then we need to rely on the recovery software which has advanced algorithm to retrieve the rest content. FAT file recovery is by no means an easy task, as it provides no easy way to judge which cluster belongs to the deleted file. Thus recovery tool has to read all clusters following the initial one without considering whether they are occupied by other data. Another way is read information of clusters that are not taken by any data. Which solution gets better recovery result? The answer is when they work together. The second solution is fast and recovers some fragmented files when file system is available. 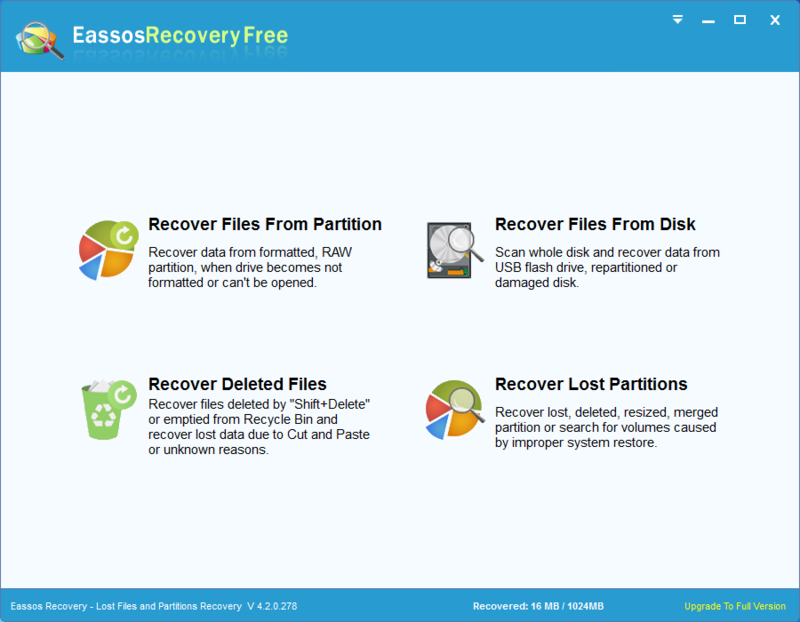 Eassos Recovery Free recovers deleted files from FAT12, FAT16, FAT32, exFAT and NTFS disk with advanced scanning solution. Deleted files will be displayed at one when they are found during scanning. It tries best to restore data with original structures, meanwhile it can restore files by file type when file system is empty or file overwriting happens. This recovery scenario takes place on the assumption that deleted files are not overwritten. However, in real life, data loss issue is not the case. It’s easy to gets deleted files overwritten, and FAT recovery of deleted file will be more difficult. This entry was posted in Data Recovery and tagged FAT file recovery, FAT recovery, FAT recovery software, recovery software by EASSOS. Bookmark the permalink.